Mayor de Blasio has announced his support for the legalization of marijuana in New York and outlined his plans for how the city would adapt in a healthy, safe and equitable way. Rana Novini reports. Mayor de Blasio has announced his support for the fair and safe legalization of marijuana Thursday morning and has outlined a plan for how New York City will adapt to the legalization of recreational marijuana, days after Gov. Andrew Cuomo announced his plan to push for the measure across the state. On Thursday, the mayor and wife Chirlane McCray discussed the report released from the mayor's task force on cannabis legalization, months after de Blasio tasked the group in July to "set forth New York City's vision of what legal cannabis should look like here." The report, "A Fair Approach to Marijuana," was produced by the Mayor's Task Force on Cannabis Legalization, which was convened in July 2018 to identify the goals and challenges that should guide the City’s preparations for potential legalization. "We are talking about change and it has to happen the right way," de Blasio said during the conference. Mayor Bill de Blasio revealed his plans should marijuana become legal in New York City. Ken Buffa with the latest. In a letter accompanying the 70-plus page report released Wednesday, de Blasio wrote, "We have a once-in-a-generation opportunity to get a historic issue right for future New Yorkers. Legal cannabis is coming to New York State. When it does, we must do all we can to make sure that happens in a way that is safe, takes the health of New York City residents into account, and above all, provides opportunity while righting historic wrongs." De Blasio additionally wrote, "We’ve seen these kinds of new industries spring up before. Legalization can follow two routes. In one, corporate Cannabis rushes in and seizes a big, new market, driven by a single motive: greed. In another, New Yorkers build their own local cannabis industry, led by small businesses and organized to benefit our whole diverse community." "Tragically, we know what happens when corporations run the show," he said, citing the harm wrought by the pharmaceutical, tobacco and oil industries. During Thursday's press conference, de Blasio said the city must do something to "avert all the disasters" of big pharma. 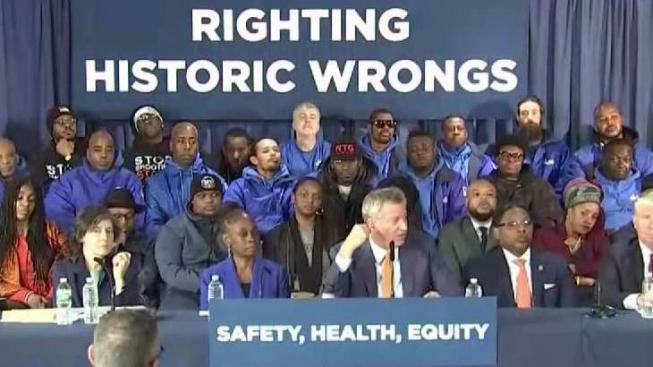 "We know the laws to date have caused many people to suffer and often the suffering has been profoundly unequal," citing that communities of color and low-income areas have received "the brunt of the so-called war on drugs," de Blasio. "If we know that the laws of the past were written in an unequal and unfair way, we should be ware that it doesn't happen again." De Blasio referred to the city already attempting to "right these types of wrongs" by ceasing to arrest people for low-level possession. Mayor de Blasio is outlining a plan for how NYC will adapt to the legalization of recreational marijuana, days after Gov. Cuomo announced his plan. Ray Villeda reports. He later referred to new legislation in the works saying, "In the new law that will be written, let's automatically expunge past convictions for low-level marijuana crimes. Let's give New Yorkers a clean slate." "Safety means regulating the market, to ensure that supply is clean and safe. It means keeping people from driving while under the influence. 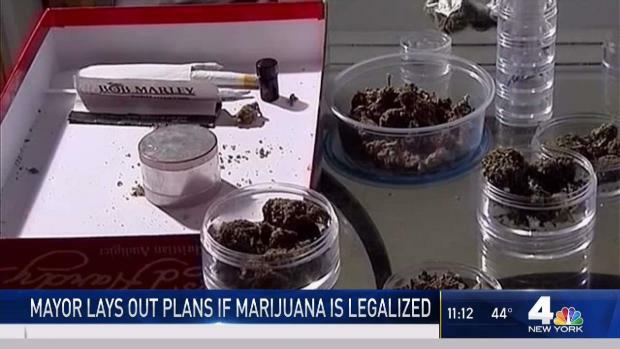 And it means making sure that kids don’t have access to cannabis." "Health means educating the whole community, and young people especially, about the real public health risks that legalization may pose, including dependence, traffic collisions, and impaired cognitive capacity." "Equity is especially important, because we have a painful past to overcome. The burden of current cannabis laws has not been shared equally. For far too long, one's race has played too big a role in determining criminality. Too many people of color have seen their lives ruined by low-level arrests, locked out of jobs and prosperity by a single joint on the street." De Blasio said he wants to make sure that "those who bore the brunt of past burdens reap the most future benefit," meaning that a majority of the opportunity generated in the new pot industry go "to people of color, to low-income New Yorkers, to people whose lives have been stalled by marijuana convictions, or those who live in neighborhoods where there have been the highest number of marijuana arrests." He also wants revenue from the marijuana industry to fund public health campaigns, job training programs and low-interest loans to support local entrepreneurs and workers in the field. 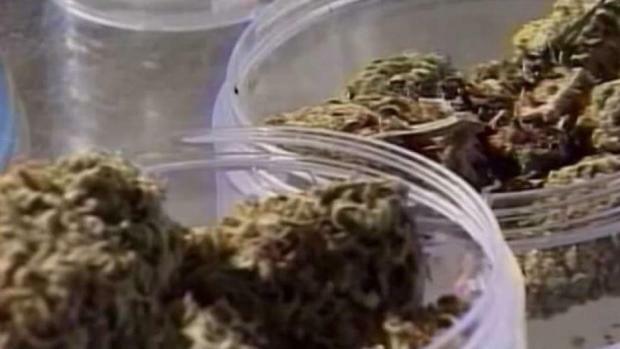 First Lady Charlane McCray, who leads the city's mental health and substance misuse efforts said that as the city and state move toward legalization, says the city's report presented a "fair, safe and thoughtful approach to the legalization of marijuana." However, she also noted that though she believes that legalization in the city and state is the right path, the risks of legalization must also be taken into account. On Monday, as part of his remarks outlining his agenda for the next term, Cuomo said he planned to push for legalizing recreational marijuana within the first 100 days of his third term, though he didn't immediately provide a timeline for legalization or say how those efforts would go forward. The governor once referred to pot as a "gateway drug" and said he was "unconvinced on recreational marijuana," but in July conceded that the "situation on marijuana is changing," the New York Times reported. He said Monday legalizing pot would be part of a "true justice reform."